There are a number of good reasons why many of the post-9/11 movies (In the Valley of Elah, World Trade Center, Reign Over Me) have failed to come to terms with the aftermath of that tragic moment and the subsequent wars that followed. Besides depicting those events through conventional melodrama employed only to stir audience empathy, these films actually leave little to the imagination.While trying to make sense of a time that is still being played out, each movie leaves scant room for reflection. This might be why Zero Dark Thirty, a movie about the mission to kill bin Laden, fails to resonate with the power the subject warrants. Despite all the heated debate about the picture’s point of view on torture, for example, director Kathryn Bigelow (The Hurt Locker) actually backs away from the dramatic core of that subject. While I think it’s clear that she isn't endorsing waterboarding as a means of getting information, she also isn’t delving into why it would be a considered means of interrogation for tracking down the mastermind of 9/11. Her picture simply depicts the steps of that quest, the full facts not withstanding, but she leaves out the dramatic ambiguities that would give the story a quickening pulse. The performances in the movie are also so attenuated, so inert, that the actors can't take us into the larger, more disturbing questions which means they never get engaged (despite the media hoopla). Zero Dark Thirty fails, for instance, to even bring to light how national policy has changed significantly from the era of the Cold War (where two superpowers with the ability to incinerate the planet tried to avoid that catastrophe) to the post-9/11 period (where the enemy isn’t concerned with what happens in this world, but rather the possibility of salvation promised in the next one). These uneasy examinations of interrogation, international security and the subject of terrorism (which has a whole different cast when seen in the context of religious fundamentalism instead of the secular kind offered by Communism) are not being explored in these 9/11 movies because the thinking in them hasn't moved past the tropes of the Cold War years. They may be contemporary films about post 9/11 but they end up feeling stuck in the past. During the Vietnam era, American directors couldn't depict the war in Southeast Asia, so they sought instead to capture the country’s mood indirectly through period pieces (Bonnie and Clyde, The Godfather), horror films (Night of the Living Dead) and earlier wars (M*A*S*H*). Those pictures (and many others, good and bad), didn’t make declarative statements about their time; they were deeply felt impressions of a tumultuous period in political and cultural history. All these years later, many of them still have the power to resonate (whereas Zero Dark Thirty, with its lack of urgency, seems to be already disappearing from public memory). However, when considering Ben Affleck’s equally controversial, yet highly entertaining, Argo (which comes out on DVD on Tuesday), you can see more interesting dramatic ideas at work. Looking back at the 1979 Iranian hostage crisis, Affleck gives his story (despite its various inaccuracies) something of an arc that takes us to the present. And even if Argo is consciously designed as a commercial crowd-pleaser there is still a deeper story under the thrills. Argo also says something about the decade that followed the period that this movie covers. Perhaps proving that not all commercial projects created for a mass audience get corrupted by corporate culture, Argo displays the presence of an artistic sensibility that lurks under its clear desire to entertain. Based on an article by Joshuah Bearman (“How the CIA Used a Fake Sci-Fi Flick to Rescue Americans from Tehran”) in the April 24, 2007 issue of Wired, Argo is a clever dramatization of how CIA operative Tony Mendez (Ben Affleck) led the rescue of six U.S. diplomats from Iran during the revolution that brought the Ayatollah Khomeini and his medieval brand of Islamic fundamentalism to power. More than 50 of the embassy staff were taken as hostages, but six escaped and hid in the home of the Canadian ambassador Ken Taylor, here played by Victor Garber. After exhausting a number of possible plans for extracting the hostages, Mendez creates a cover story inspired by a television viewing of Battle for the Planet of the Apes with his son. 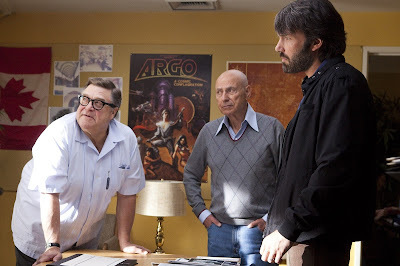 He tells his supervisor Jack O’Donnell (Bryan Cranston) to get him in touch with Hollywood makeup specialist John Chambers (John Goodman) who has often prepared disguises for other CIA operatives. Through him, they contact film producer Lester Siegel (Alan Arkin), who sets up a fake studio that publicizes a plan to make a science fantasy film in the style of Star Wars called 'Argo.' The idea is to enter Iran and provide the six escapees with false Canadian passports and identities depicting them as the film crew for this fantasy picture which is scouting Iran for the possibilities of shooting it there. The tension in the story derives from the contrast of the revolutionary government’s attempts to find the missing embassy workers (by having children putting together the shredded paper containing their identities) and Mendez inspiring trust in the group that his plan will work. Some of what truly happened during the hostage crisis has been jettisoned here, especially the role of Ken Taylor (who did way more than just open and close doors). And this particular thorny point has taken up most of the debate about the film (as well as ideologically flavoured accusations of racism towards the film's depiction of the Iranians). But rather than damn Argo because of the typical American ignorance about Canada, or its inability to provide a more nuanced understanding of the Iranian people, it might be more worthwhile drawing as much attention to just how well crafted the picture is. 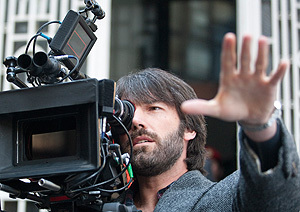 As a director, Ben Affleck has already shown a keen and intelligent eye for popular storytelling. His first picture, Gone Baby Gone (2007), was not only a crackerjack procedural but it was also a terrific chamber ensemble for a number of the performers. (He even miraculously elicited the first wide-awake performance from his brother Casey Affleck.) His follow-up picture, The Town (2010), had an inferior, less-believable script, but the direction was swift and the actors – especially Jeremy Renner who brought a bit of James Cagney’s balletic intensity to his role – made the movie worth seeing. Argo might be his strongest, most confident picture yet because it has more going on than just a desire to whip up enthusiasm (despite the invented climax of a last minute airport escape which is too derivative of other action pictures). Affleck’s Mendez isn't a typical hero, despite his success rate as a CIA operative, because he performs his duties with a self-effacing precision. Despite his height and handsomeness, Affleck always looks as if he’s in the process of finding his own feet (much like the equally bearded Warren Beatty did as the frontier town dreamer in Altman’s McCabe and Mrs. Miller) which makes him a more appealing saviour because he doesn’t act out of self-righteousness. (When he returns from his mission, he’s told that President Carter called him a great American. “A great American what?” he asks. “He didn’t say.”) But this underplaying of heroism is germane to the general theme of the film. Argo takes place towards the end of the Seventies, a decade when American heroism was tainted by the assassinations of the Sixties, plus the dirty tricks of the Nixon years and Watergate; and on the cusp of the Eighties, when Ronald Reagan became President, and his regime helped usher in a decade of fantasy superheroes that brought back jingoism as a popular adventure model. In Argo, Affleck shrewdly shows us that the fictional fantasy film, which Mendez uses to spirit the hostages away, had only just made a comeback through the popularity of Star Wars in 1977. During the conclusion of Argo, however, when the camera pans over a young boy’s bedroom filled with Star Wars toys and other comic characters, we get a clue about the decade ahead. 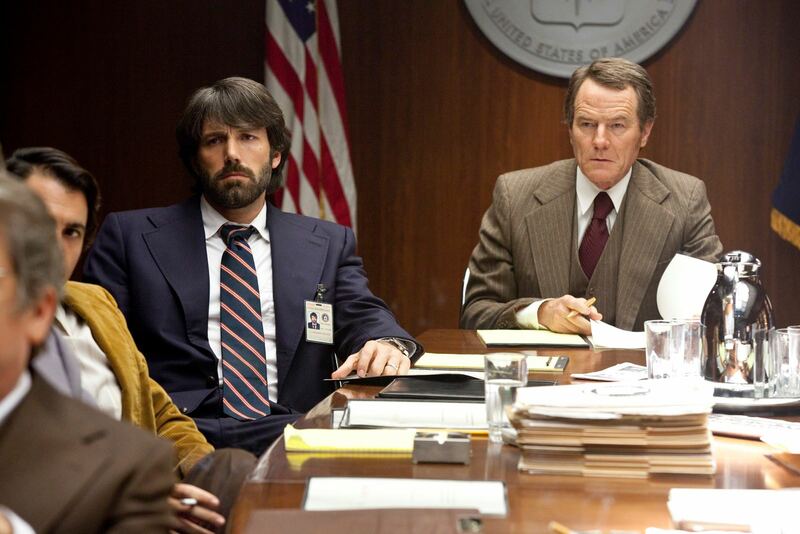 ‘Argo’ would ironically become the predominant model in American commercial action cinema. We would even have a former B-movie actor as President of the United States. Argo begins with a comic strip history lesson showing how the American overthrow of a democratic regime in Iran led to the tyranny of the Shah which ultimately sewed the seeds for the religious zealotry to follow. The point here however is not to reduce history to comic-book simplicity, but to show us how these shorthand visual depictions create powerful visceral responses that movies tend to enhance. Affleck is trying (in an age when formula dominates American movies) to execute a meaningful use of formula and showing us how you can use it to breathe life into a complex story (while sometimes having to leave out the complexity). Although fundamentally Zero Dark Thirty is a more ‘serious’ work than Argo, it’s Affleck’s film that lingers as the more affecting movie. He dares with the hindsight of time to inventively toy with popular formula styles; those styles that today get reduced to largely impersonal forms of entertainment. Zero Dark Thirty, on the other hand, deliberately avoids the temptation of boiling the blood with commercial cunning. Bigelow resists moving with emotional complexity into the dirty areas of the so-called War on Terror. But Argo finds its life by confidently using contemporary popular forms in order to provide a reflecting mirror of the past. The film not only doesn't get mired there: it stares straight ahead into the present. And like the best of Seventies commercial cinema, Argo shows no signs of ever dying on the screen. – Kevin Courrier is a writer/broadcaster, film critic, teacher and author (Dangerous Kitchen: The Subversive World of Zappa). 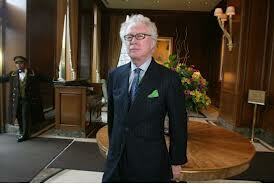 His forthcoming book is Reflections in the Hall of Mirrors: American Movies and the Politics of Idealism. Geez, Kevin. I think you read a lot into the proceedings here. Every film is, by nature, a time capsule. But that's about it where 'Argo' is concerned. I found it almost unbearably lame and devoid of any central performance to make the thing watchable or give it a dynamic focus. Affleck sleepwalks.